This weekend I'm off to Nanjing for the Lantern Festival, but first I have to brave Shanghai Railway Station in order to get there. All my trips so far have exited from Shanghai South Railway Station, an architect-designed masterpiece of a modern station, more like a UFO than a transport hub. 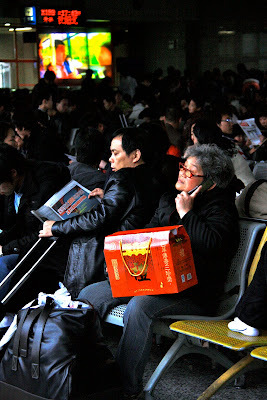 On the other hand, Shanghai Railway Station, I'd heard, is one place in Shanghai you need to carefully guard your belongings. And your children. And your chickens, if you have them. Our waiting room was one of twelve massive caverns, each one seating 1000 people with standing room for another thousand. I love railway waiting rooms for the sheer diversity and colour of the travellers encountered there, and these were no exception. We shared ours with grandmothers on mobile phones, a group of Buddhist monks and two really annoying British businessmen loudly discussing what they disliked about their wives.